Offering you a complete choice of products which include uninterruptible power supply. Uninterruptible power supply (UPS) that delivers cost-effective power protection in a compact package. The UPS provides battery-backed outlets and a surge protection-only outlet. 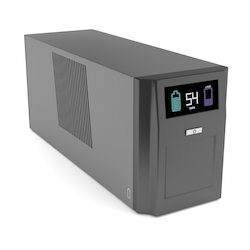 The UPS battery offers four minutes of backup power at full load—ample time to shut down protected equipment if an outage occurs. Liebert PSP UPS provides three battery-backed UPS outlets; one surge protection-only outlet; Data Line surge protection; USB port; Liebert MultiLink software, and a two-year warranty. Liebert PSP is available in: 350 and 500VA at 120VAC; and 500 and 650VA at 230 VAC.